The Federal High Court sitting in Lagos has struck out a fundamental rights enforcement suit filed by an alleged kidnapper, Chukwudumeme Onwamadike, popularly known as Evans. 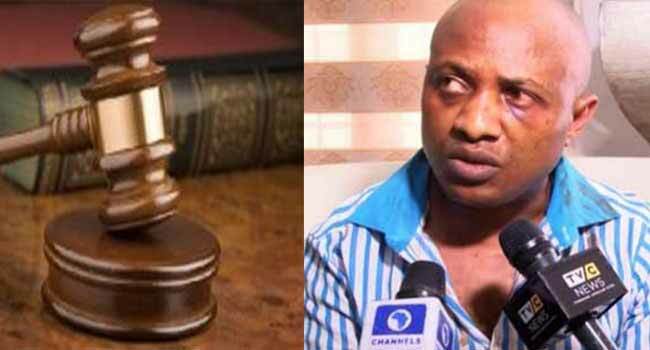 Evans had filed the suit against the police over the seizure of his property. Giving a ruling in the suit on Monday, Justice Mojisola Olatoregun held that the court lacked the jurisdiction to entertain the case. She stated that the proper venue to ventilate the suit ought to have been the Lagos State High Court where the applicant was already facing charges of kidnapping. The judge also noted that the respondents did not file any defence despite being served hearing notices. According to Justice Olatoregun, the main issue to be decided is whether the plaintiff’s claim constitutes a violation of his rights under the Fundamental Human Rights (Enforcement Procedure). She added that the right to own property cannot be denied except for the due process of the law and, therefore, held that the applicant failed to show that, within the circumstances of his arrest, the property were forcefully seized. “The only conclusion I can draw is that the property was taken consequent upon his trial for kidnapping before the Lagos State High Court,’ the judge said. She noted further that although federal and state high courts had concurrent jurisdiction, the instant case ought to have been taken to the court where the defendant was facing trial for kidnapping. “This court must be careful not to interfere with due process of the ongoing trial of the applicant before the Lagos State High Court,” the judge held. “This court lacks the jurisdiction to entertain this case; same is hereby struck out,” she held. Evans had through his lawyer, Mr Olukoya Ogungbeje, in June 2018 filed the suit and joined as respondents, the Inspector-General of Police (IGP), the Nigeria Police and the IGP’s Intelligence Response Team. In the suit, he asked the court to declare that the alleged forceful seizure of his property by the respondents without any court order was illegal and unconstitutional. The suspect listed some of the properties to include N1billion, two residential houses located at Magodo in Lagos State, a Brigade wristwatch worth $20,000, necklaces worth $25,000, and five pieces of diamond rings. Also listed were one Lexus 470, a Grand Cherokee, a Toyota Highlander, 85 Samsung television sets, 45KVA generator, 22KVA generator, 20KVA inverter worth N10 million and five sets of freezers. He had urged the court to compel the respondents to apologise to him and pay him N1 billion as damages for the alleged forceful seizure of his property. He also sought an order of perpetual injunction restraining the respondents from taking any action against him or any of his property in relation to the case.